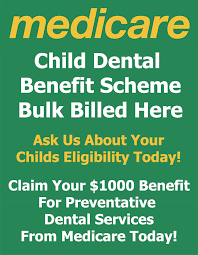 We are offering free dental care for eligible kids as part of the Child Dental Benefits Scheme. This scheme started in 2014 and offers $1000 worth of dental treatment over 2 years. Unlike most other surgeries, we BULK BILL all eligible general dental treatment (including check ups, x-rays, preventative fissure seals, fillings and dental extractions) up to the $1000 limit so there will be no out of pocket expenses for the majority of kids. Starting in 2014, the Child Dental Benefits Schedule has helped 3.4 million eligible children between the years of 2-17 access private dental clinics to maintain and improve their oral health. please fill out the form below and we’ll get back to you as soon as possible. You can also call us anytime for a chat and we’ll answer your questions the best we can.